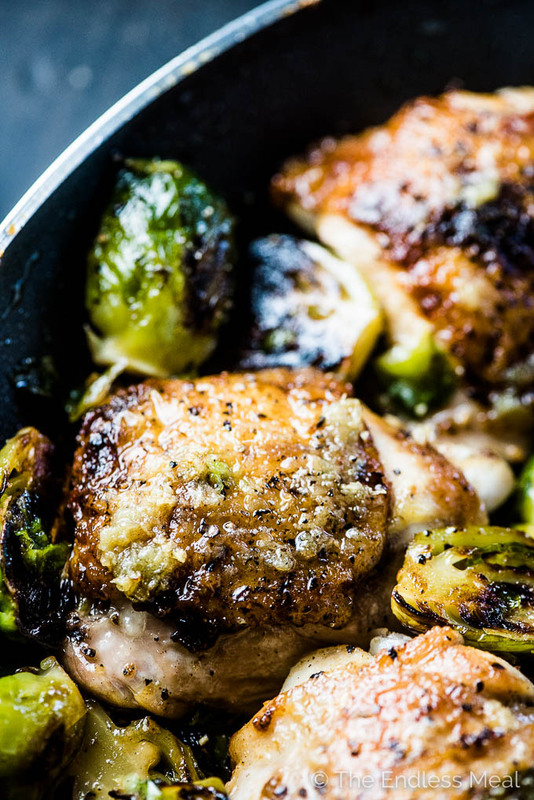 Garlic Butter Chicken and Brussels Sprouts is a super easy to make (5 ingredient!) and healthy autumn dinner recipe. It's made on the stovetop with only one pan so clean up is a breeze, too! Google tells me that nearly everyone in the world drops the ‘s' and types chicken and brussel sprouts when they're searching for this recipe. I'll keep the ‘s' in brussels sprouts so my computer doesn't keep telling me that I've made a spelling error. 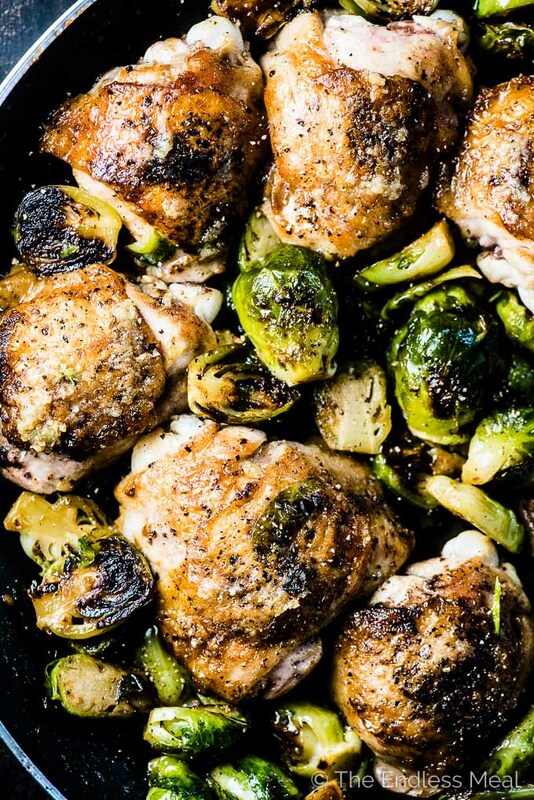 Just know that if you're looking for chicken and brussel sprouts, you're in the right place! 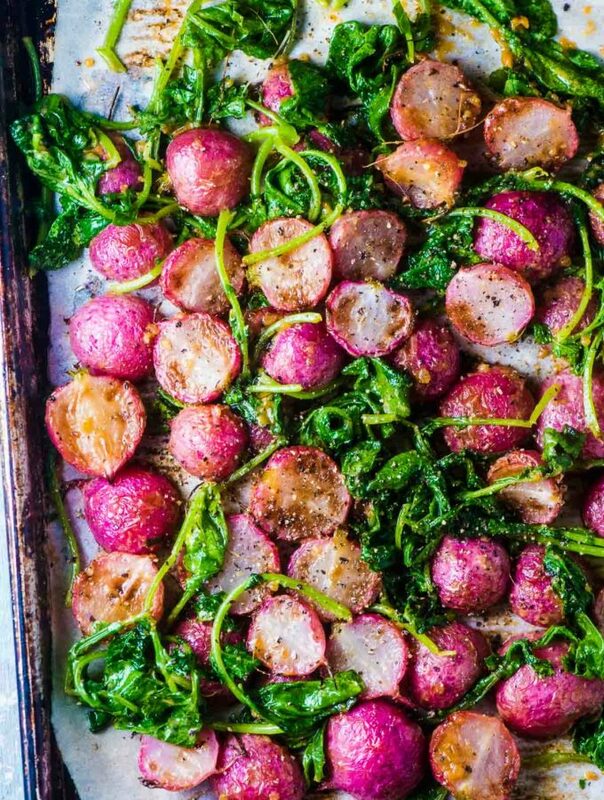 It's September which means that all our favorite fall veggies are hitting the markets. Read: brussels sprouts! 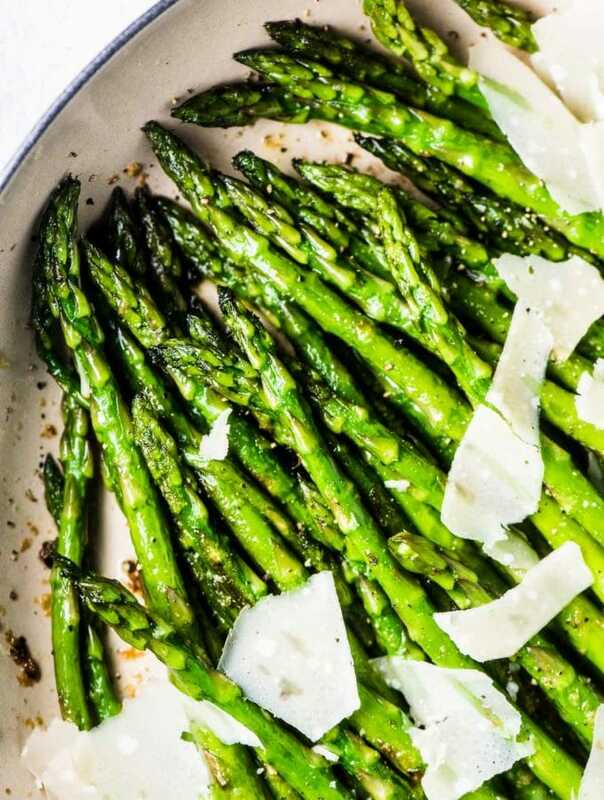 It's a 5 ingredient dinner recipe that you can whip up in no time flat. 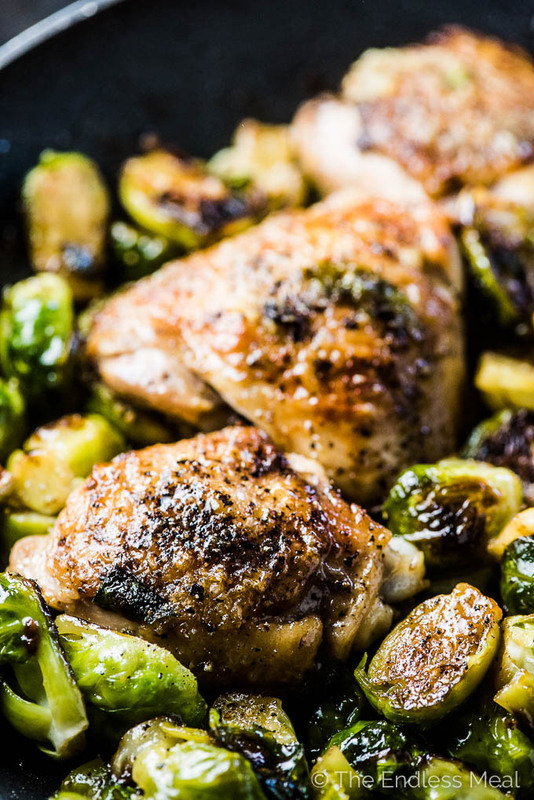 This isn't just a chicken and brussels sprouts recipe, it's a GARLIC BUTTER chicken and brussels sprouts recipe. Because garlic butter makes everything better. 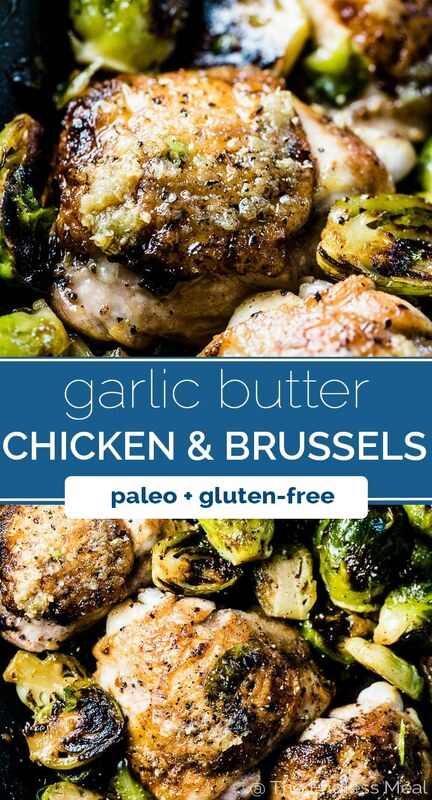 When you add the butter to the pan it mixes with the chicken stock and wraps itself around the brussels to make a creamy and delicious garlic butter sauce. This baby is low-carb, gluten-free, paleo, and easily made Whole30 by swapping ghee for the butter. It's comfort food you can feel good about eating. I have certified proof that this is a kid-friendly recipe. ← I know that sounds HIGHLY unlikely. Here's the deal: my 2-year-old girl gobbled this up and even loved the leftovers reheated for lunch the next day. Want to know the trick? It's an easy one. All I had to do was tell her that brussels sprouts are baby cabbages and she was all over it. Baby anything wins her over. Are your kids the same? So tell the young ones you've made garlic butter chicken with baby cabbages and everyone will be happy. And just look at those brussels sprouts! As much as I'm a summer girl, autumn food wins me over every time. Bring on the comfort food! 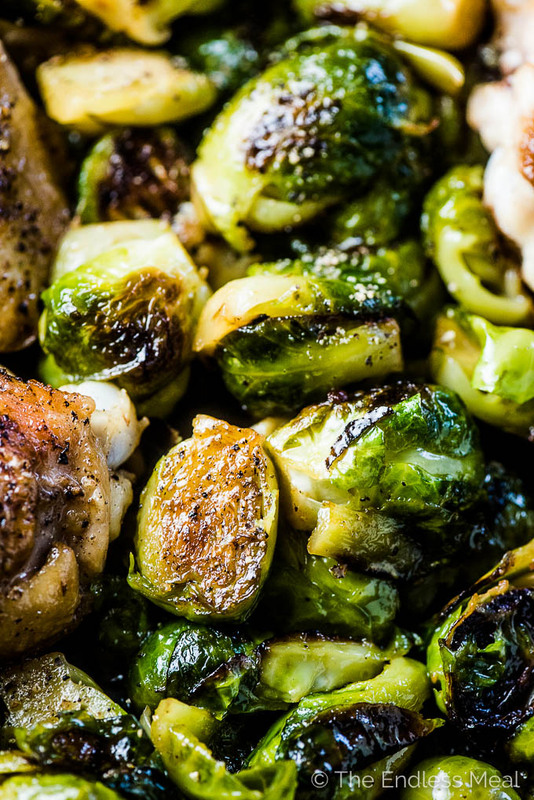 The special thing about this brussels sprouts recipe is the way the chicken stock and butter come together to form this glossy little sauce that coats every nook and cranny on these gems. You get the feeling that they were tossed in a light cream sauce, even though the only hint of dairy is the smallest amount of butter. It's magical. Decide whether you want crispy chicken skin, or not. I love it, so I almost always leave it on. But it does add a whole lot of calories to the recipe. You choose which works best for you! Brown the chicken in the pan. If you've left the skin on, make it nice and crispy. If you've taken it off, make sure the chicken gets nice and brown so it's extra pretty. Now pour some chicken stock into the pan and let it simmer until it disappears and the chicken is cooked through. This is the best part. Add the butter and garlic to the pan and stand back as your entire house starts to smell AMAZING. Now spoon some of that garlic butter sauce over the chicken. Bonus: Turn this recipe into lemon garlic butter chicken by squeezing a half of lemon over the chicken. 2 in 1 chicken recipe! 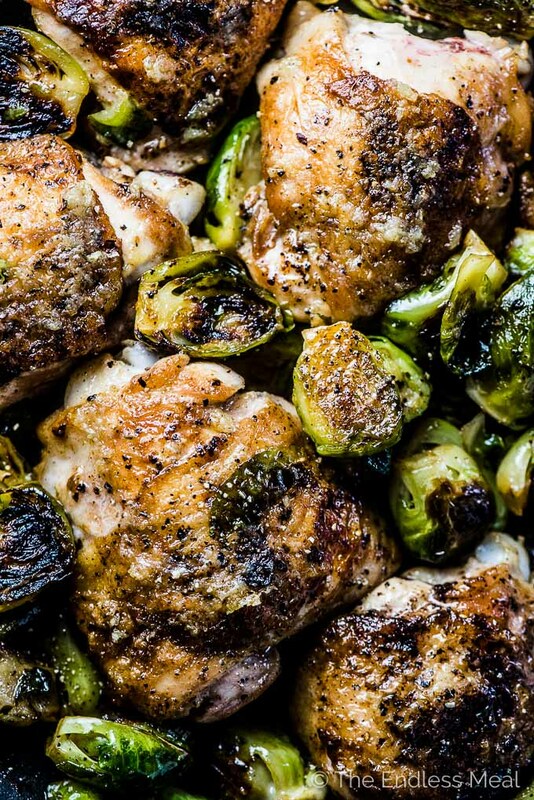 Now my friends, go pour yourselves a glass of wine and dig into your chicken and brussels sprouts (or should I say chicken and brussel sprouts.) Enjoy! 8 chicken thighs – skin on or off, your choice! Add the chicken to a non-stick frying pan over medium-high heat skin side up. (If using skinless thighs, add a teaspoon of oil.) Sprinkle half the salt and pepper over the chicken and let it cook for 5 minutes, or until it has browned on the bottom. Flip the chicken over and sprinkle on the remaining salt and pepper. Cook until the skin is crispy or the top is brown, about 6-7 minutes. Remove the chicken from the pan. While the chicken is cooking, cut the brussels in half. Add the brussels sprouts to the pan and let them cook until they are brown on one side, about 5 minutes. Push them to the side of the pan and arrange the chicken on the other side of the pan. Pour the chicken stock into the pan (not over the crispy chicken) and let it simmer until the pan is dry and the chicken is fully cooked, about 15 minutes. Pile the brussels sprouts on one side of the pan and add the butter and garlic. Let the garlic cook for 2 minutes then spoon some garlic butter over the tops of the chicken. Mix the rest of the garlic butter into the brussels sprouts. Serve with lots of extra black pepper. Loved it! Super simply and great tasting! This was great! I wanted something quick and healthy to quick while at he grocery store. 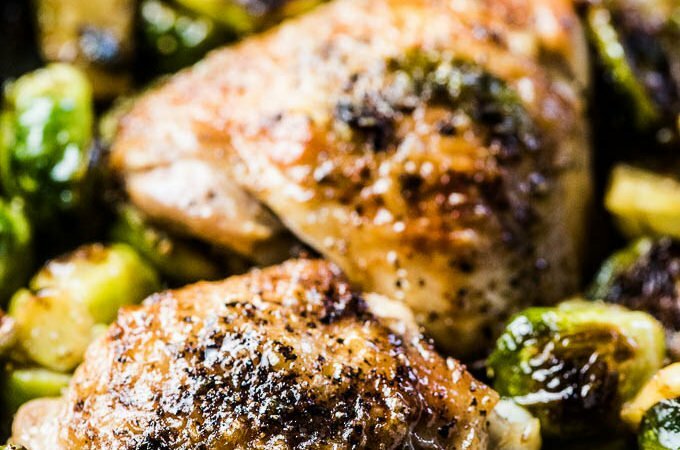 I googled chicken and Brussel sprouts and found your recipe. I decided to give it a try and was able to cook the meal in about 35 min or less. I chose skinless breasts and I was so happy after wards. I was full but still felt light. I will definitely cook this again and will peruse your other recipes as well! The flavors were good, here, but I had to take my brussel sprouts out far before the end to avoid them turning into mush. If you like a bit of bite in your veggies, I’d recommend you keep a close watch on the sprouts and remove them after only a couple of minutes in the broth. I followed the recipe, but the chicken was under done! Put it back in the pan for another ten minutes and it was perfect! You must have had some big chicken! So happy to hear you liked the recipe once the chicken was cooked through! Not to be too picky, but Brussels really should be capitalized, as it refers to Brussels Belgium of which it is the capital. This sounds so good! One question … is the chicken bone in or boneless? Made this tonight and used chicken breasts instead since that what I had. It was wonderful. I gave credit to you and my husband thanks you! It was easy so I thank you too! Judy, how many chicken breasts did you use, and were they boneless/skinless? 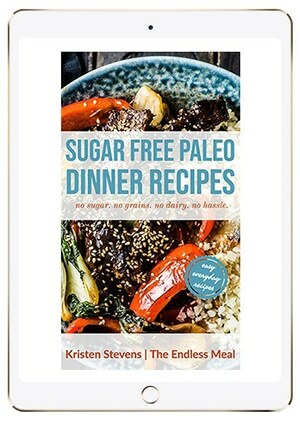 *Kristen, if you can advise please do!